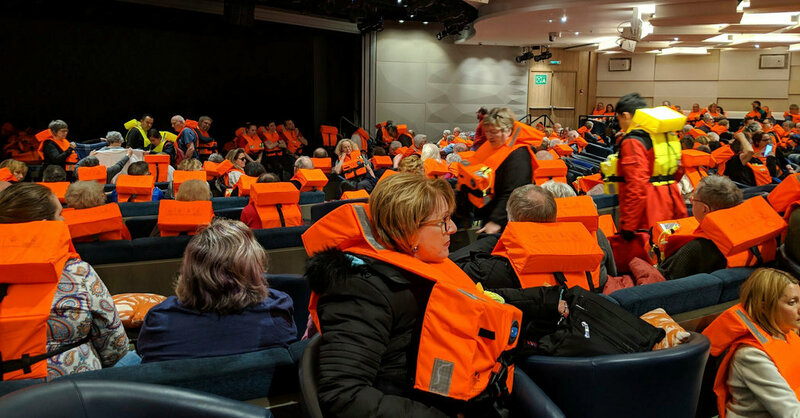 LONDON — A cruise ship carrying more than 1,300 people was finally heading to shore on Sunday after becoming stranded off Norway for nearly 24 hours with engine trouble and after a harrowing rescue operation in rough weather to evacuate hundreds of people by helicopter. More than 890 people — 436 passengers and 458 crew members — were still on the 47,800-ton ship, the Viking Sky, as it headed toward Molde, a coastal town in western Norway, with one tugboat in front and another in the rear, the Norwegain Joint Rescue Coordination Centers said on Twitter. At 10 a.m. local time, the ship was about 50 miles from shore, having recovered the use of some of its engines. Some rescued passengers arrived onshore bruised and battered, the Red Cross said. “Nothing similar has happened before, not in this magnitude,” Einar Knudsen, a spokesman for the Joint Rescue Coordination Center for Southern Norway, which was leading the rescue operation, said by phone on Sunday. The ship was scheduled to arrive on Tuesday in Britain’s Tilbury Port on the River Thames. Many older passengers were onboard, including people from the United States, Britain, Canada, New Zealand and Australia. The vessel was traveling between two Norwegian ports, Tromso and Stavanger, when it sent a mayday alert on Saturday afternoon that several engines had failed. Rough weather — high winds and 26-foot waves — hampered the effort to evacuate the passengers of the Viking Sky, which began around 2 p.m. local time on Saturday. At least three passengers had sustained serious injuries. Video footage and images shared by the cruise ship passengers on social media showed a terrifying ordeal as the ship swayed and furniture and people were sent sliding across the floor. Other photographs depicted hundreds of people strapped in fluorescent life jackets. “The ship has been turned from a westward to an eastward position with the help of two tugs,” Mr. Knudsen said. “It’s moving at a speed of 8 knots,” he added, with three of its four engines now working. The Viking Sky was expected to arrive in Molde around 3 p.m. local time on Sunday, but Mr. Knudsen, the spokesman for the rescue operation, said that the bad weather made the exact time hard to predict. “There’s strong current, heavy winds, and waves between five and eight meters high. It’s impossible to say,” he said.